An IP warehouse is used when your store has inventory in a location that does not fulfill customer orders directly. This manual warehouse is used to transfer stock to other locations that do handle order fulfillment. In Inventory Planner, IP warehouse stock is imported when the warehouse is created. Then stock is added through receiving a purchase order or warehouse transfer. Stock is depleted by creating a transfer to another location. Finally, stock can be manually updated within Inventory Planner if a correction is needed. Create a combined warehouse to see demand and total inventory levels across locations. Learn about how to set up a combined warehouse for various replenishment scenarios. Check out our video to learn about how an IP and combined warehouse can be used together. Disable all locations so that you see combined information by default. > Warehouses. Click '+ New IP Warehouse'. Name the warehouse and save it. Important Note: Be sure to check which warehouses are enabled so that you are seeing all detail needed for replenishment. 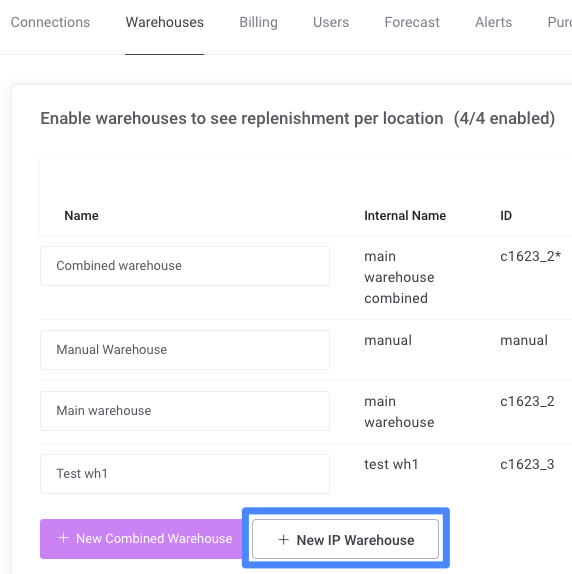 To add stock to your IP warehouse, click on Replenishment from the left menu, and then click on variants under your the new warehouse. If you have inventory levels to enter for several variants, then you could import this information instead. 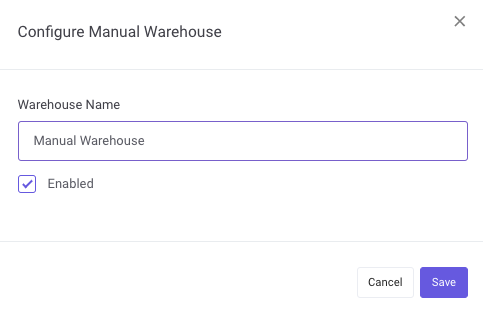 In Replenishment, click on Import at the bottom of the screen, then select Manual Warehouse Stock. 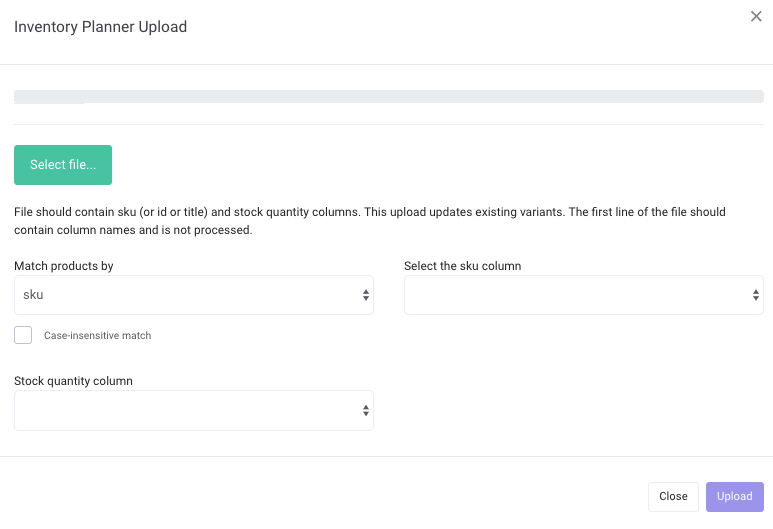 To import stock levels, you will need a spreadsheet with two columns: one with the SKU (or other unique identifier like barcode) and the stock level. Attach your spreadsheet. Then check to make sure the correct column from your spreadsheet is matched to the correct field in Inventory Planner. As with other warehouses, be sure to set the correct Lead Time and Days of Stock for this location. Learn about how to update the lead time and days of stock. Learn about setting lead time and days of stock for various warehouses, including a combined warehouse.